Do you happen to love the Clackamas River as much as we do? 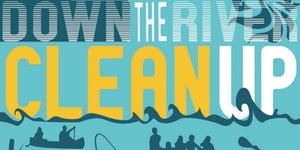 We Love Clean Rivers, in partnership with the Clackamas River Basin Council, invites you to join them as they host the 13th Annual Down the River Clean Up on Oregon’s Clackamas River on Sunday, September 13th, 2015! Once again they’ve put together a spectacular day of organized chaos where 400+ river-lovers jump in their rafts, kayaks, drift boats – or maybe even dawn a snorkel mask – uniting to scour the banks and bottom of 20+ miles of riverway from Milo McIver Park to Clackamette Park where the Clackamas empties into the Willamette. Community members are encouraged to come float and fill the boat! Keeping the Clackamas clean will help preserve and protect the health of this beautiful and bountiful river that provides fresh drinking water to hundreds of thousands of Oregonians and is home to old-growth forests, endangered species , and one of the last remaining wild salmon runs in the Lower Columbia Basin. Everyone is encourage to join the event. All non-motorized paddle crafts may participate and launch at one of four parks. On-water and on-land volunteer opportunities are available. SCUBA divers are also welcome. All volunteers must pre-register. For their hard work, all volunteers are invited to a free BBQ at Barton Park from 3:00 – 5:00 p.m., featuring local 3 Guys Grilling of Damascus and raffle prizes! Event sponsors include Clackamas River Water Providers, eNRG Kayaking, Oregon Watershed Enhancement Board, Metro, Clackamas County, American Medical Response, Oregon Parks and Recreation Department, Clackamas River Outfiltters, Department of Environmental Quality, SOLVE, and Safeway.